WAIANAE, Hawaii — A late-afternoon rainstorm may have kept us from touring the nearby fields from which our dinner-salad greens had just been harvested and from dining in the outdoor patio at garden’s edge. But it hadn’t dampened our introduction to the Kahumana Café, an unpretentious eatery tucked away in Oahu’s Lualualei Valley. Our meal was simply — as they say in Hawaiian slang — “broke da mouth” good. The farm-to-table meal, the rural setting and the rustic ambience of the place had our foursome vowing to return. 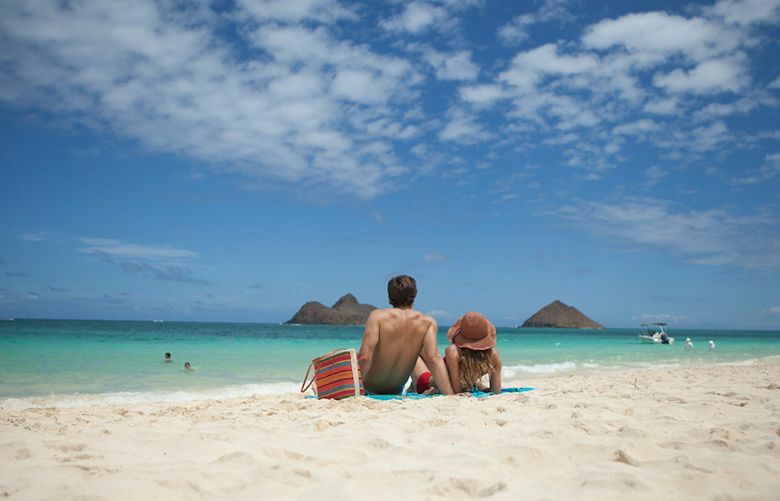 To do so we sought tips from former and current island residents about shopping, eating, beaches and attractions, ending up with a list of hidden gems so long that it will take another visit to get to them all. While serving our meals, Robert Zuckerman, the cafe manager at Kahumana Organic Farm, Café and Retreat Center, explained that the decade-old cafe serves as an on-the-job training program and revenue generator for a nonprofit that provides social services for the disadvantaged. Our entrees, each less than $20, included macadamia-nut pesto pasta and vegetables crowned with grilled mahi mahi, and a coconut dal lentil chicken curry with rice and fresh vegetables. The lilikoi (passion fruit) cheesecake was a perfect finish. Alcohol is not served but BYOB for adults is fine. Dining reservations recommended; required for farm tours (86-660 Lualualei Homestead Road, Waianae; 808-696-8844 or kahumana.org). Just a few blocks beyond Kahumana Farm we visited Naked Cow Dairy Farm and Creamery. The small family farm with a herd of seven cows and assorted birds and other critters opened in 2007. Its cheeses and butters can be found at select island restaurants and grocery stores. We purchased two Goudas at the farm after Shantelle Sylva, the farm’s cheesemaker, explained that local guava wood was used to smoke one type and that Hawaiian-grown chili peppers were used to spice up another. 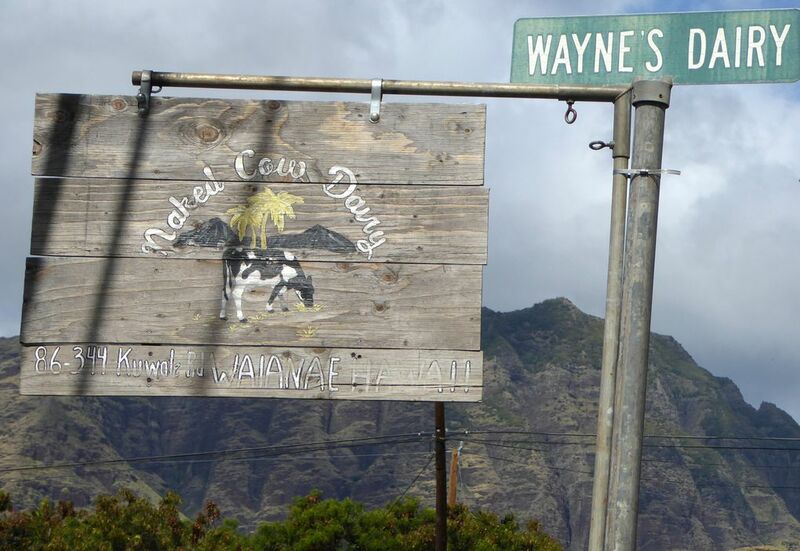 Farm tours and cheese-making classes are offered, and reservations are required (86-344 Kuwale Road, Waianae; 808-696-7430 or nakedcowdairyhawaii.com). We visited several recommended farmers markets that have sprouted up on the island but the Saturday morning Makeke Waianae, a farmers and green market, was our favorite. With no crowds and no waiting, the vendors had time to talk about their products. 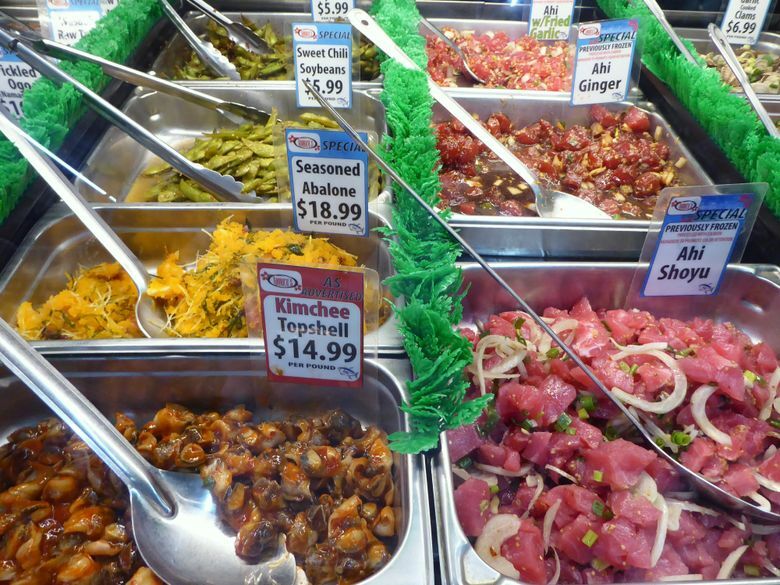 This gem was more a true farmers market than arts-and-crafts fair (86-120 Farrington Highway, Waianae; 808-697-3709). 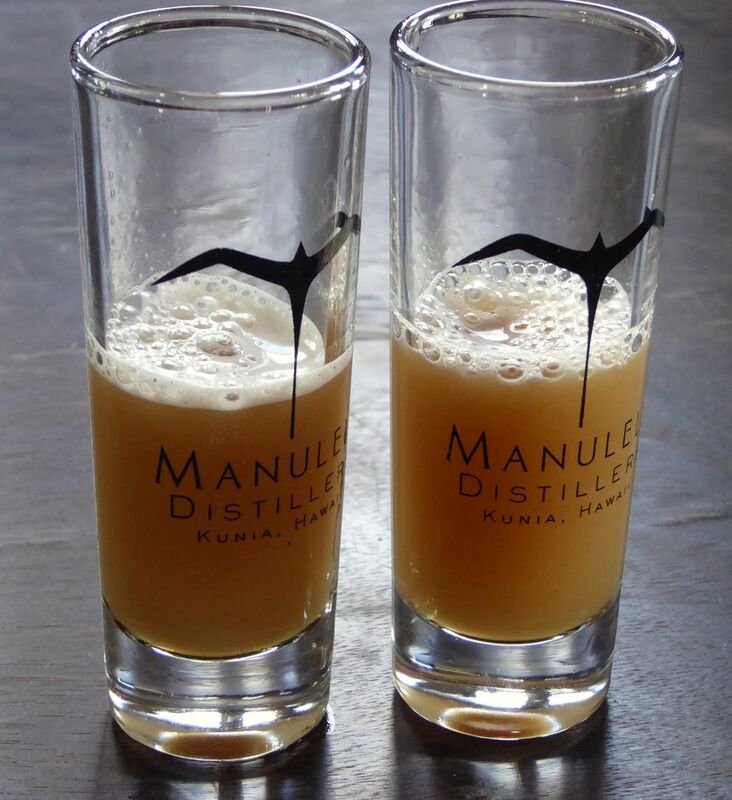 “Try some sugar cane; it’s free,” Terence Holmes called out as he fed fresh cane into a juicer in the spacious tasting room at Manulele Distillers. This farm-to-bottle rum distillery is making a name for itself with its production of Ko Hana Hawaiian Agricole rum, made from sugar cane, not molasses. Set amid hand-harvested cane fields, the distillery offers several tours daily for adults 21 and older ($25 per person) and children ($15 for ages 6-20, younger than 6 free). At the tour’s end adults taste rum and youngsters are served gelato. The distillery’s display garden showcases the varieties of heritage cane plants — each has a story and staff are happy to tell you about them (92-1770 Kunia Road, Kunia Camp; 808-649-0830 or KoHana­Rum.com). Signage was limited and security fences locked at the Kalaeloa Airport, formerly the Naval Air Station, on Barbers Point. 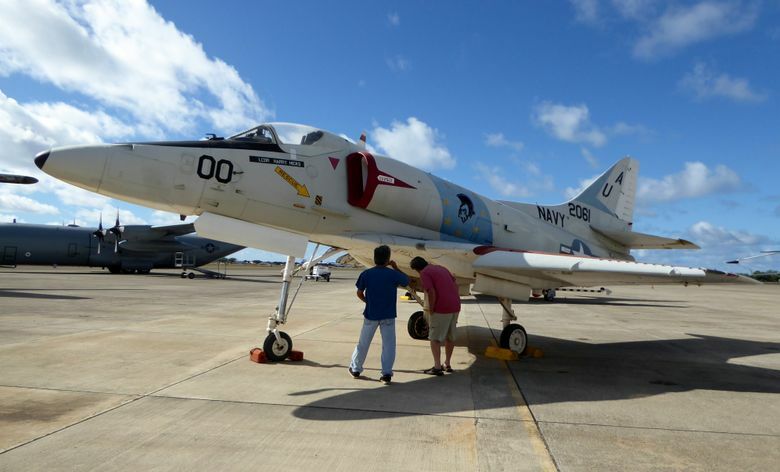 That’s one reason tours must be scheduled in advance at the Naval Air Museum Barbers Point (91-1299A Midway St., Bldg. 1792, 808-682-3982, nambp.org). A docent or staff member greets you at the gate. Our two-hour, early weekday morning tour led by Brad Sekigawa, museum historian, and Brad Hayes, executive director, was one of the highlights of our trip. We were able to get up close and personal with airplanes and helicopters, going into some, standing under others, touching, photographing and asking questions. Displays include trucks, tanks, fire engines, helmets and flight gear. Reservations are a must. Donations: $15 for adults, $10 seniors/military, $8 for younger than 18. To avoid the intense midday sun on the tarmac, book a tour for early morning or late afternoon. Another local favorite, Tamura’s Market (91-1051 Enterprise Way, Kapolei, 808-853-4700, tamurasmarket.com), is a couple blocks from the museum. A quonset hut that once served as the Navy commissary is home to this modern, family-owned supermarket. The historic building was worth the stop but we found an additional gem in their selection of Hawaiian poke (raw fish marinated or in salad). The view of Waimea Bay and the channel between Oahu and Kauai was breathtaking from our 300-foot-high blufftop vantage point at Pu‘u o Mahuka Heiau (off Highway 835, Pupukea, 808-587-0300, bit.ly/oahuheiau). But so was seeing the island’s largest heiau, an ancient Hawaiian temple and National Historic Landmark, which had brought us there. The centuries-old lava-rock platform is believed to have been dedicated as a luakini, or sacrificial temple, where ceremonies involving animal or human sacrifices were conducted. We had the place to ourselves save for the six wild roosters that patrolled its perimeter. Entry is free; limited on-site parking. 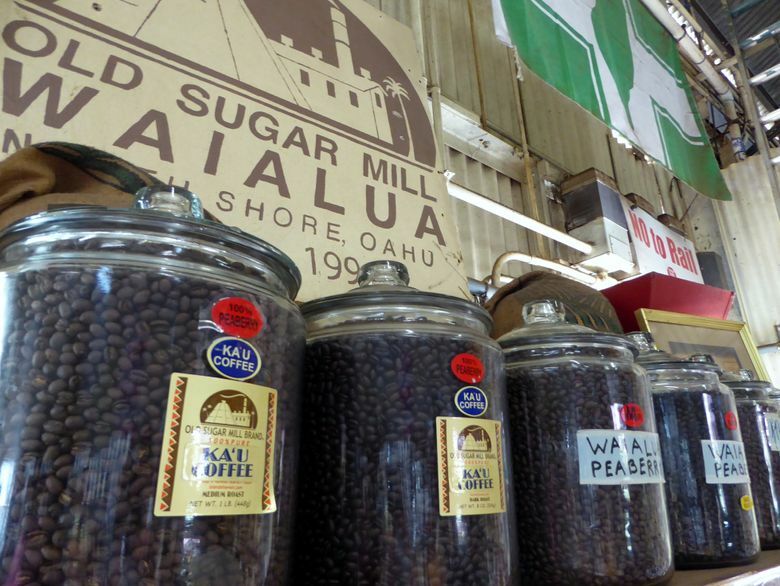 After nearly 100 years of operation the Waialua Sugar Mill (67-106 Kealohanui St., 808-637-2624, islandxhawaii.com) quit producing sugar in 1996. It is now home to Dole Foods’ Waialua Estate Coffee and Cacao Mill. The beans, grown in nearby fields, are processed at the old mill. A handful of stores operate out of the old mill’s buildings. One, Island X Hawaii, in what was once the old mill’s garage, sells souvenirs and other tourist items. The store’s staff members offer a free, informative mini tour of the coffee and cacao processing operation, and it concludes with free tastes of coffee and chocolate — both of which are sold at the store. Dillingham Airfield (Farrington Highway, Mokuleia, airports.hawaii.gov/hdh), toward the end of the road at Kaena Point, was recommended as the place to go to watch gliders and sky divers. We also saw some spectacular kite surfing just down the road at Mokuleia Beach Park. Parking was free. Although recommended by several, the threat of rain and lack of climbing footwear kept us from tackling the Pillbox Hike/Ka‘iwa Ridge Trail (382-498 Kaelepulu Drive, Kailua; bit.ly/2I0IJ5c). It’s not for everyone; write-ups say the narrow dirt trail with steep drop-offs climbs a steady steep grade from the trailhead. 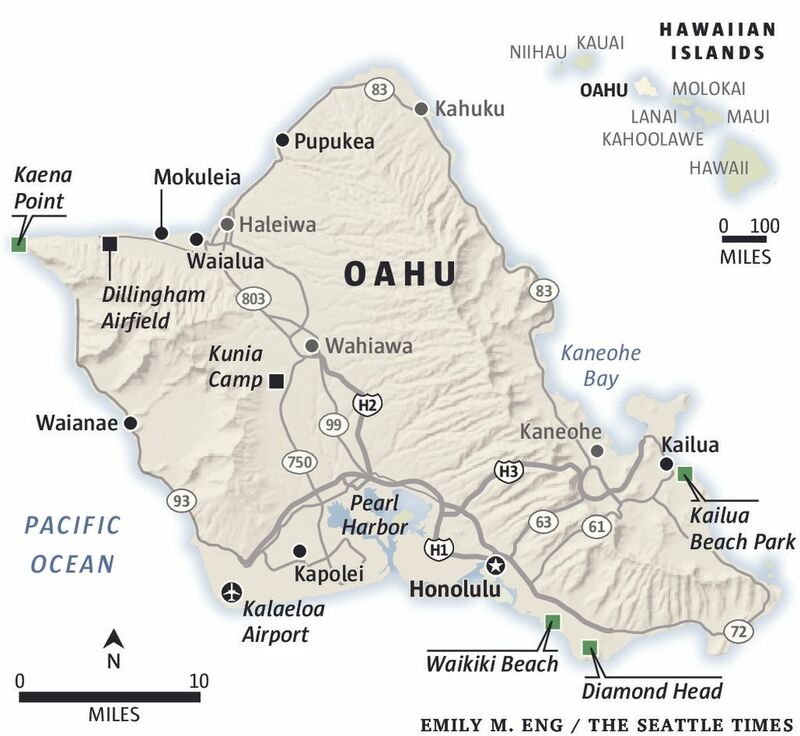 Numerous reviews noted the climb, but also rave about the views of Mokulua Islands, Kailua and Lanikai from a pair of concrete bunkers that served as lookout stations during World War II. Even with rain clouds threatening, the turquoise waters off Kailua Beach Park (526 Kawailoa Road) were as striking as they’d been described to us. Plenty of free parking spaces were available the weekday we visited. Buzz’s Original Steak House (413 Kawailoa Road, 808-261-4661, buzzsoriginalsteakhouse.com) opened 55 years ago across the street from Kailua Beach. While there have been upgrades and modernization over the years, its footprint has changed little. For the best people-watching, we dined at the horseshoe-shaped bar and enjoyed the banter between longtime regulars and wait staff. The small wood-frame, plantation-style green and white Kalapawai Market (306 S. Kalaheo Ave., Kailua, 808-262-4359, kalapawai­market.com) sits to the side of a traffic roundabout. The little market has been serving the neighborhood since 1932. It still offers groceries and beverages but these days has a deli serving food to eat on-site or take-away, which makes it a favorite with beachgoers. 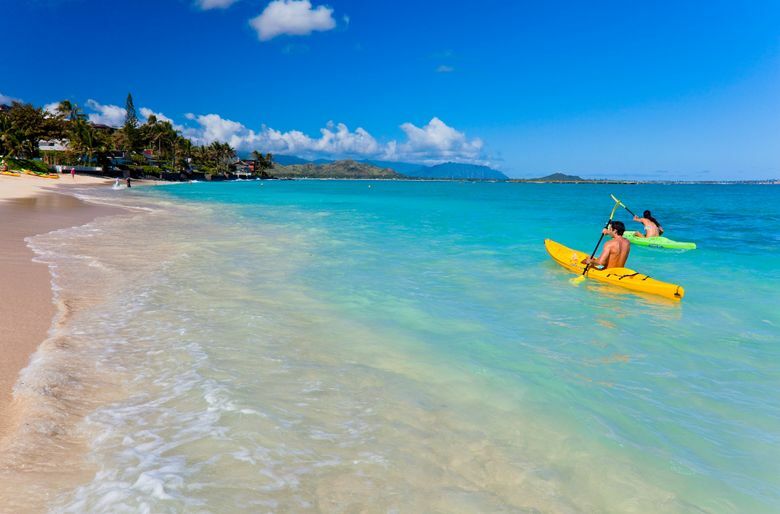 Jackie Smith, a freelance writer from Washington State who now lives in Greece, regularly makes a pilgrimage to a timeshare on Oahu.